Everybody barfs. 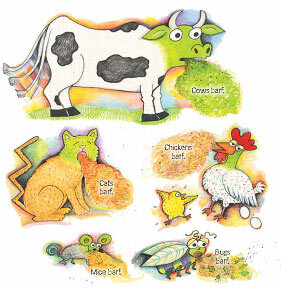 Dogs, cats, chickens, alligators, and even you. It happens to everyone, and sometimes it even happens…at school. With her characteristic humor and compassion, Nancy Carlson helps young readers through what is often a scary and embarrassing rite of passage. Sometimes you barf. But it’s OK. You get better! Everything you ever wanted to know about throwing up…and why you shouldn’t be embarrassed. A little girl and her dog, Archie, take readers through this primer. Everybody barfs once in a while, she says, and illustrates her point with a veritable zoo of barfing animals, from aardvark to platypus. 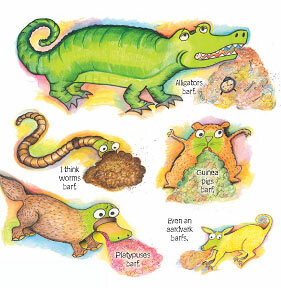 (In this book, when something or someone is about to barf, its face gets amusingly green, except for lizards, which get pink.) When a dog barfs, it gives plenty of warning—and after it does, you might find something you’ve been looking for, like a missing sock. The flu could cause you to barf, and if it happens at school, better hope you do it on a math test. It summons the janitor in a hazmat suit for cleanup with his “special barf cleanup machine” and sends you home to a barf bucket. Once you’re eating solid food, it’s back to school! Everybody welcomes you warmly, and it turns into a great day…except for that math test you have to retake. Maybe if you manage to barf again…? Another page of green-faced barfers—clown, caterpillar, leprechaun, etc.—and the little girl recaps. Archie barfs again, and she finds her other sock! Carlson’s cartoons are as goofily gross as the text, but they exert a sort of cute fascination anyway. 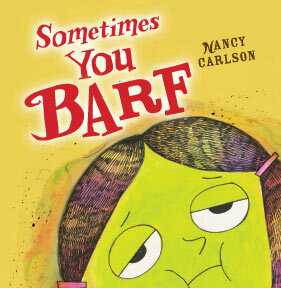 2 Responses to "Sometimes You Barf"
I just want to send a comment to Nancy Carlson and say this is the most fantastic book. My 8 year old has Emetophobia (fear of vomit), and has been going to a therapist and working on exposure. Yesterday she discovered this book at the library, read it and she excitedly showed it to me and told me it was HORRIBLE! and then we grinned at each other and she happily checked it out and we will read it every night until it is due, and then we plan to buy it. THANK YOU for this book, you are truly an incredible artist. She SO identifies with the girl hiding in the locker – THAT’S TOTALLY ME! she said!! Thank you!! Glad you like my barf book! !